I've said this before, part of the fun of writing this blog is learning new things. I had no idea this car existed. I knew the Prince name and that Prince became part of Nissan at some point, but I really didn't know anything about the cars they made. I certainly didn't know they made anything this entertaining. 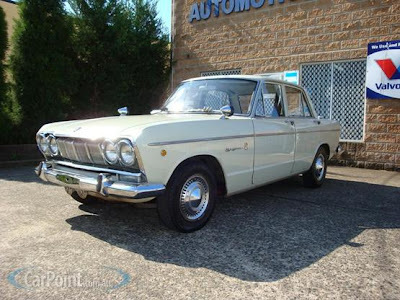 "In 1965, just before the Prince company was taken over by Nissan, a new S54 model Skyline was released. 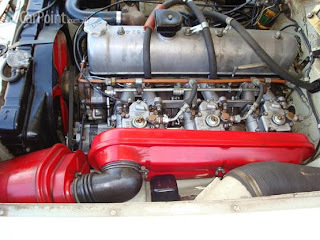 It featured a nose lengthened by 20cm to allow the fitting of a 2-litre six-cylinder engine in place of the normal four-cylinder. In its ultimate GTB 2000 development, this car was - in every respect - a very worthy predecessor to the modern GT-R.The engine in the GTB was a highly-tuned version of the overhead cam two-litre G7 six, featuring a high compression and with three Weber 40DCOE-18 carbies bolted to the side. Power was transmitted to the ground through a factory 4.444 LSD, and a fuel tank of nearly 90 litres capacity meant that pit stops could be kept to a minimum! Measured performance included a 0-97 km/h time of 10.1 seconds and a top speed of over 190 km/h. 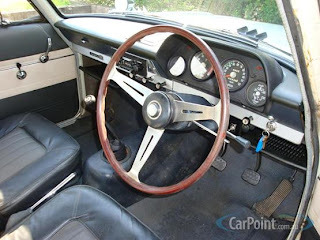 Here was a car utterly different from the contemporary Japanese norm." This engine has 125 HP (To put that in perspective, a 6 cylinder Ford Mustang had 120HP) and a 6500 RPM redline. Only the Japanese could have styled this car. The nose looks like it could have come from a Russian car. From the side it looks like any generic small US sedan. The back-end, with it's Ford Cortina-like tail lights, is typical bizarre-o 1960s Japanese. It's a mess, but that's part of its charm. What makes this car truly amazing is that it's a one owner un-restored car. It has just over 53,000 miles on it and comes with the original receipt, warranty card and owner's manual. The asking price is steep, around $27,000.00 (US). 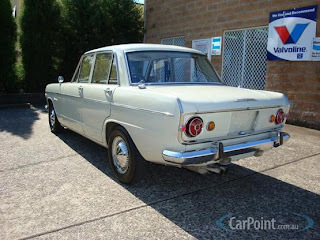 Located in New South Wales, Australia, Click here to see the CarPoint listing for this car.